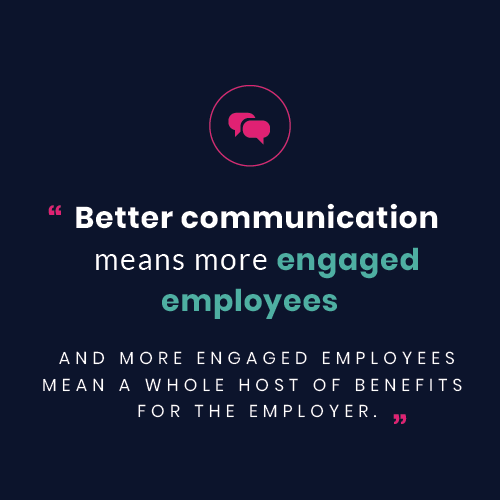 Better communication means more engaged employees. And more engaged employees mean a whole host of benefits for the employer. A Gallup study found that the most-engaged teams were 21% more productive and 22% more profitable than the least-engaged. High levels of engagement with well-being programs tend to mean fewer high-cost health insurance claims (which raise your costs as an employer). The same goes for engagement with aspects of insurance like annual visits and preventative care screenings. You should make clear that insurance is not just for going to the doctor when you’re sick. Good communication means employees feel valued by their employer, which impacts morale and company culture in a positive way. A solid employee communication program is what’s needed: a year-round, consistently-branded program that reaches out to employees in the ways they prefer, whether that’s print or online, email or snail mail. And it’s not just about benefits. Corporate changes, sales goals, safety benchmarks you’ve met, company news… Get the word out! Transparency and honesty are key elements of buy-in. Employees want to feel “in the know,” like they are part of the team, not underlings. Spreading the good news is just one part of it. A good communication program informs employees of any update concerning their benefits. You gotta take the good with the bad, as they say. More on that in just a moment. Communications are worthless if employees don’t look at your messages, so you have to go where they are. If most of your employees are on a factory floor, sending out an email about a new well-being program won’t reach anybody. A postcard sent home or a poster in the break room might work better. If you don’t communicate with your employees often, the result is that they perceive any news coming out as negative, especially when it surrounds healthcare. It’s a knee-jerk reaction. So your employee communication plan should be year-round. Use the same look, feel, and channel (email, mail, etc.) to communicate on a regular basis. Get them used to your messages, and you’ll boost engagement. Not all communications can be “rah-rah” positive. When insurance costs are going up or restructuring is imminent, you have to share that news, too—just like you would when your sales or safety goals are met. Otherwise, employees feel betrayed. This is a delicate—but super-important—subject, so we’ll go into detail here. Say a business has acquired several companies over a few years. Through the transition period it becomes apparent that several positions are duplicated. That means lay-offs. Not a good thing. But when you can present it to remaining employees as a way to streamline services and better serve clients, it’s evident that the move will position the company better in the marketplace and make it more profitable. And that’s a good thing. With healthcare costs steadily rising, there’s usually some bad news every year in that area. Can’t be helped. But don’t let employees find out about higher deductibles or increased premiums by reading the open enrollment book. Explain why the changes are happening—be transparent. It could be that the increase in premiums is tied to high-cost claims the previous year. Tell your employees. Then explain how it’s still cheaper than buying insurance on their own, and stress the value of your insurance plan. One last thing: be quick. Don’t let employees find out about changes before you have a chance to frame the message. If you don’t communicate with people, they form their own opinions, which might be wrong. Give them information so they know what the changes are and can understand how they’ll be affected. When it comes to employee communication, consistency and transparency should be your watchwords. Put together a plan for year-round communication of benefits information. “Train” your employees to expect messages from HR, and that will increase engagement… and drive benefits usage. Your communication plan should also have provisions for the not-so-good news. By being honest and getting the word out in a timely manner, you can lessen the negative impact.